I recently made some beef and pork filled cabbage rolls. They were meaty and delicious, but my favorite part of the rolls was both the flavor and texture of the farro. This got me wondering about what a meatless roll stuffed with only farro would be like. Because you’re losing out of texture, fat and flavor by omitting the meat, I decided to think about my rolls from the ground up. The farro was a good base for the filling since it has a meaty texture, but I wanted to include something that would give it some more body and richness. That’s why I decided to add some raw cashew nuts. When pureed, cashews make a thick cream that has a faintly sweet taste that’s not unlike fresh ricotta. When mixed with the farro, you’ll end up with a filling that’s so creamy you’ll have a hard time believing there’s no butter or cheese in it. 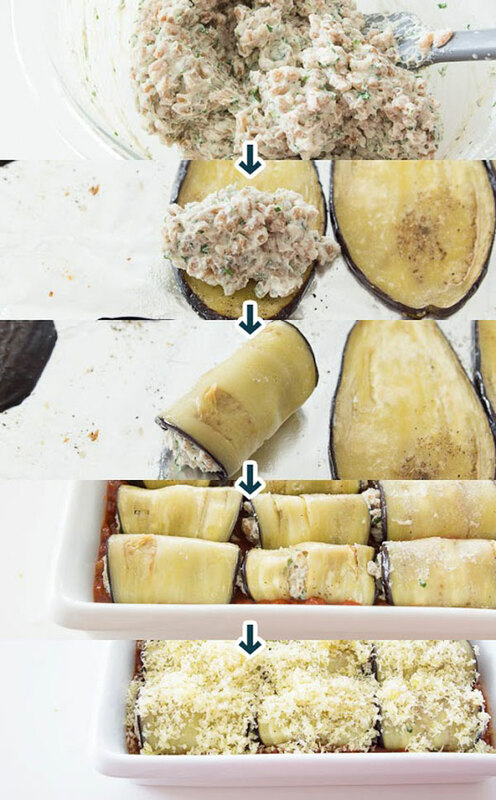 Because the filling reminded me of some ricotta filled eggplant involtini I once had, I decided to change the wrapper from cabbage to eggplant. After roasting the eggplant with garlic and olive oil, I stuffed each sheet of velvety eggplant and topped them with garlicky bread crumbs. The rolls braise in a sweet tomato sauce until the flavors meld and the topping turns a golden brown. I often see vegan recipes laced with hyperbole like “this is so good, even meat-eaters will love it” or “this is just as good as the version with meat”. But hearing such promises from someone who hasn’t eaten meat in years isn’t all that reassuring. As a card-carrying omnivore, I hope my words bear a little more weight when I tell you that these meatless involtini couldn’t possibly be made better by adding meat or dairy. Unapologetically rich and creamy, these vegan involtini taste downright bad for you. But while the amount of olive oil needed to roast the eggplants isn’t going to qualify this as diet food, it’s certainly healthier than it tastes. With textures ranging from crispy to satiny, and a bevy of contrasting flavors to match, each bite is different from the one that preceded it, making these rolls as fun to eat as they are to look at. Because this dish is a little involved I’m going to assume you know how to make a basic tomato sauce (or that you have a store-bought one in the pantry). If not, you can use the tomato sauce portion of my chicken parmesan recipe. While I love the toothsome texture of farro, if you need to make these gluten-free, just replace the farro with cooked brown rice, or quinoa and use gluten-free breadcrumbs. Roll up creamy farro with garlic roasted eggplant to create a satisfying and healthy dish from Marc Matsumoto of the Fresh Tastes blog. Trim the tops off the eggplants and slice them lengthwise about 1/3-inch (8 millimeters) thick (you should get about 11 slices from each eggplant). Whisk the olive oil and garlic together in a large bowl and then quickly dip each slice of eggplant in the mixture to coat both sides evenly, scraping off the excess oil on the side of the bowl. Arrange each slice on baking sheets in a single layer. Save the remaining olive oil and garlic mixture for the topping. 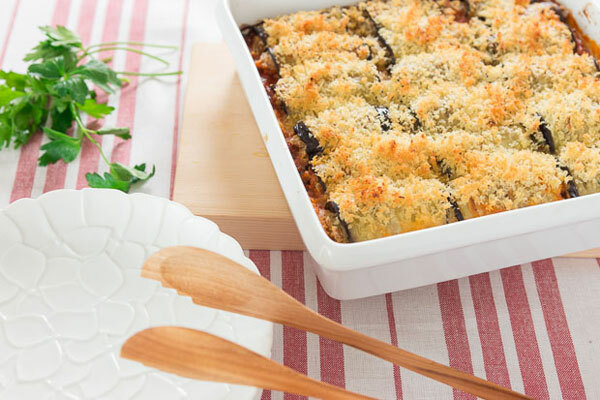 Sprinkle the eggplant with salt and pepper and then bake until lightly browned and tender (about 10 minutes). 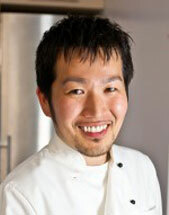 Meanwhile, boil some water and pour the boiling water over the raw cashew nuts. Let the cashews soak for 30 minutes. Wash the farro and add it to a pot with 5 cups of water and 1 tablespoon of salt. Bring the water to a boil and then turn down the heat to maintain a gentle simmer. Cook until tender, about 25-30 minutes. When the cashews are done soaking, add 1/2 cup of the soaking liquid to a small food processor or high-speed blender and then drain the cashews. Add the soaked cashews, salt, pepper, and nutmeg to the food processor and process until smooth and creamy (you may need to scrape down the sides of the food processor a few times. When the farro is done, drain it and add it to a bowl with the pureed cashew and minced parsley. Stir to combine. Lower the oven temperature to 375 degrees F.
Pour the basic tomato sauce and 1/2 cup water into a 10" x 10" casserole dish and stir to combine. 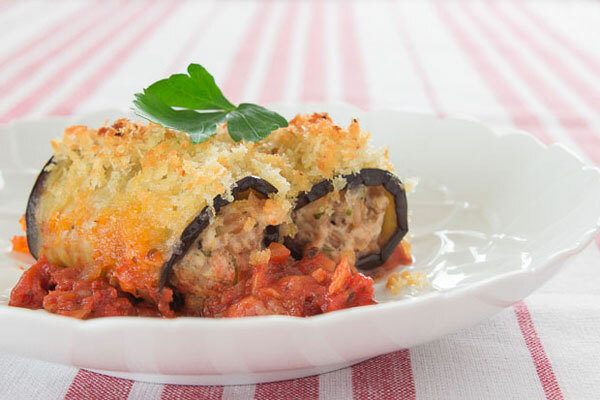 To make the rolls, add about 2 tablespoons of filling to the broad side of each piece of eggplant and roll, placing the finished rolls in the tomato sauce seam-side down. Don't use the edge pieces of the eggplant if you have enough middle slices. Add the panko to the remaining garlic oil from the eggplants and stir to combine. Sprinkle this mixture on top of the rolled eggplants. Bake until the panko is golden brown and the tomato sauce is thick and bubbly (about 40 minutes).